Two things that everyone seems to love — fall and bourbon — form the basis for this spin on a classic cocktail by bartenders Bryan King and Megan Draughon. 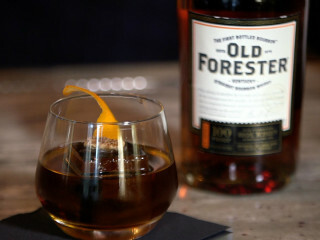 Their Fall Fashioned highlights the full flavor of Old Forestor's bourbon whisky, with an added spice from black walnut bitters. Add a Luxardo cherry to a mixing glass with ice, then add the bitters, whisky, and simple syrup. Stir well and strain the mixture over a large-format ice cube in the cocktail glass. Rim the glass with the orange peel, and add the pecans for garnish.